Joovy Zoom360 Ultralight Jogging Stroller Giveaway Event | More Crunchy Beach Mama! Need a new stroller? Here is your chance! It’s Groovy Joovy Week at Thrifty Nifty Mommy. Every day this week (Monday through Friday) there will be a new Joovy product highlighted! Monday, Janessa shared a review and giveaway for the Joovy Caboose stroller. Yesterday, Miranda shared a giveaway and review of the Joovy Tricycoo 4.1. Today Miranda is sharing her review of the Joovy Zoom360 Ultralight Jogging Stroller. The Zoom 360 Ultralight is the newest addition to the Joovy jogging stroller line. Made with 6061 aircraft aluminum, it is 10% lighter and its updated design is simpler, stronger and better looking than its predecessor. The new Zoom 360 Ultralight has a straight through axle that runs straighter and truer while the suspension smooths out the bumps to provide a comfortable ride for your little one. Strong, light weight mesh reduces weight and adds better ventilation to the foot rest area, and Joovy’s signature over-sized canopy with covered window provides the best sun protection available. You also get an updated neoprene parent organizer that holds 2 cups, has a zippered pocket and uses a new easy on/off mounting system. The easy to access basket and in-seat mesh pockets offer plenty of storage so you can bring along all of your necessities. The Zoom 360 Ultralight has an incredibly easy and compact fold. The Zoom 360 Ultralight’s swivel front wheel allows for maximum maneuverability. The swivel wheel can also lock in a straight position providing a long, stable wheelbase for running or walking on long, straight paths. Car seat adapters (sold separately) are available in various models to accommodate most infant car seats. It is available in blue, red, or black. 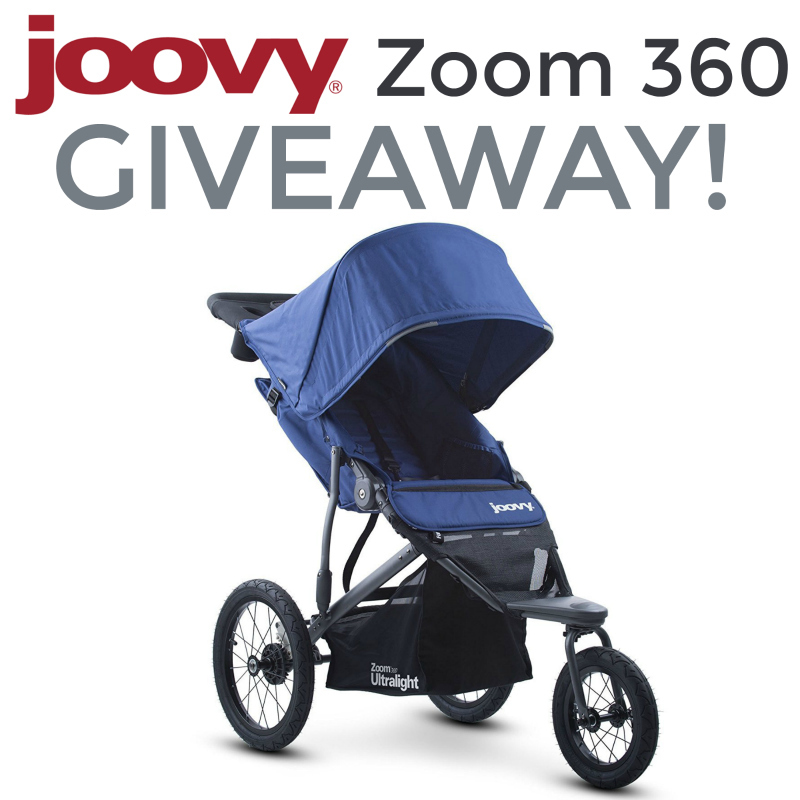 Win a Joovy Zoom360 Jogging Stroller! This giveaway is open to residents of the continental US (lower 48 states) and ends at 11:59pm EST on July 26th, 2017. Good luck! Disclaimer: One winner will be randomly selected using the Giveaway Tools random selector and notified via email. Once notified, the winner will have 48 hours to respond or a new winner will be chosen. This giveaway is in no way associated with Facebook, Twitter, Instagram, Pinterest, or Google. Void where prohibited. The sponsoring company is responsible for prize fulfillment. I would like to have the Foodoo High Chair.